It is possible that the word Morris is derived from the word ‘Moorish' or ‘morisco' (a derogatory term meaning ‘little Moors'). Certainly in the very late middle ages, Morris dancers were sometimes referred to as morisco dancers, but it is pretty certain that, whatever the origin of the word, there is no evidence that the dance came from the Moors or entered the country with the armies of John o' Gaunt or anything of that sort. Neither is there proof of any connection between Moorish dancing and Morris dancing. According to Professor Howkins, when people recorded these customs in the 1890s, they were obsessed with seeking out ancient beginnings. In the seventeenth century there had been suggestions of a connection with Moorish dancing and it was adopted as a convenient theory. It fitted in, for example, because some dancers blacked up their faces and attached bells to their legs, which was believed to be something to do with North Africa. Similarly, there is little evidence that Morris dancing has any connection with pagan festivals other than that many societies across the world celebrate calendar events with dance customs. What we do know though is that Morris dancing has a long recorded history in this country, the earliest reference being from 1448. One origin of this form of dance probably originated in the European courts of the fifteenth century. Around then, a form of dance typically called by names like "moreys daunce" was common as court entertainment; this may have been the dance form going by names like "morisco" on the continent. The dancers wore colourful, fairly elaborate costumes with pendant sleeves and attached bells. Very little is known about the dances per se, though there seem to have been two types: a solo dance, and a dance in a circle around a "maiden" (who could have been a man in women's clothing) for whose favours the dancers compete. By the early 16th century morris dancing had become a fixture of Church festivals. In mediaeval and Renaissance England, the churches brewed and sold ales, including wassail. These ales were sold for many occasions, both seasonal and sacramental - there were christening ales, bride's ales, clerk, wake and Whitsun ales - and were an important means of fund-raising for churches. 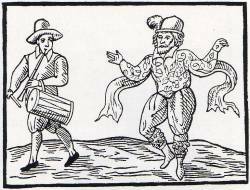 Later in the century the morris became attached to village fetes, and the May Day revels; Shakespeare says "as fit as a morris for May Day" and "a Whitsun morris dance. . William Kemp danced a solo morris from London to Norwich in 1600. Morris Dancing was popular in Tudor times. However under Cromwell it fell out of favour and was actively discouraged by many Puritans. The ales were suppressed by the Puritan authorities in the seventeenth century and, when some reappeared in the late seventeenth and early eighteenth centuries, they usually had associated dancing. By the mid 18th century in the South Midlands region, morris dancing was a fixture of the Whitsun ales. Morris Dancing was now in the hands of common folk who couldn't afford the fancy costumes of a couple centuries earlier, and they were resorting to ordinary clothing decorated with ribbons and flowers. There was a separate variety of morris, called bedlam morris, being done in a swath from the Welsh border counties through Warwickshire and Northamptonshire down to Buckinghamshire; the bedlam morris seems to have been mainly or exclusively done with sticks. Whether this ‘bedlam' morris had an alternative origin we cannot say. During the nineteenth century Morris Dancing declined rapidly. New forms of entertainment, rapid social change and its association with an older unfashionable culture were all contributing factors. For various reasons, church ales and Whitsun ales survived quite late in the south-west Midlands. Most of the Cotswold Morris tradition comes from this region and many of the Cotswold Morris sides gave dances to Cecil Sharp and other collectors which formed the basis for the dance revival in the early twentieth century. As well as the Cotswold dances other regional versions of the the morris also survived long enough to be collected. These included ‘Border Morris' from the Welsh border counties of Shropshire, Herefordshire and Worcestershire, North West from Lancashire and Cheshire, and Molly dancing from East Anglia. In the north of England long sword dancing was collected from Yorkshire and Rapper sword from the North East. It was widely believed that other regional varieties of the dance had been forgotten and lost. New evidence has recently been unearthed of ‘lost morris' in other areas of the country and that is what Rattlejag are all about! All Morris sides have their own musicians. We know that some four hundred years ago the common instruments were the pipe and tabor, but now these have been joined by the fiddle, concertina, melodeon and accordian. While the Cotswold and sword dances are usually accompanied by one musician, the border and North West teams will often have a band. In the North West this may even be the local brass band, but even if there is not a full complement of in­struments there will nearly always be a bass drum and a side drum. The tunes are drawn from many sources. Some of the Cotswold tunes are very old - for example 'Trunkles' - while others come from the music hall era ('Getting Upstairs' and 'Old Black Joe'). It is probably true to say that they were generally popular tunes of the day adapted to fit the dances. The North West dances use many march tunes.